It seems to me that most people are blaming Ferrari for dropping the ball this season, and whilst they've clearly scored plenty of own goals, for me it's an impressive performance from Mercedes who've accelerated past them that we should be focused on. In the early, to mid stages of the season many had suggested that Ferrari had become the team to beat, and in some respects that was true. Their car seemed to offer more performance on any given Sunday, not only from a well-rounded chassis and aerodynamic platform but from an ever-improving powerunit. I, on the other hand, had been cautious of the Ferrari optimism and in the places I often frequent, suggested that Mercedes still held the keys to the championship, if only they could unlock the W09’s potential. 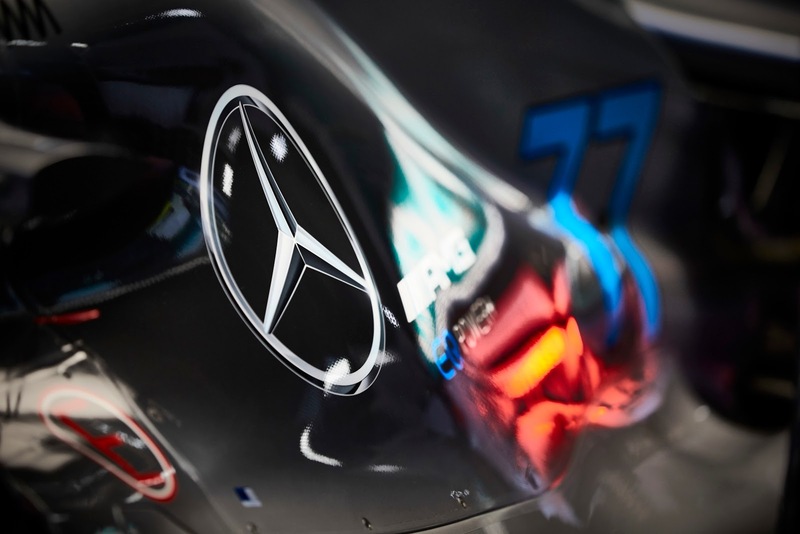 After all the W09 is the direct descendant a problem child, one that team boss Toto Wolff gave the ‘diva’ moniker and one that would need a steady nerve to wrangle. The W08 was originally conceived with a very specific hydraulic suspension system, a design that was subsequently diluted by a technical directive just ahead of the cars launch / pre-season testing. The source of the clarification in regard to this type of suspension was their closest rivals, Ferrari, of course, who themselves were looking to either learn more about the system or sow the seed of doubt at the FIA. It’s something that’s part of the game in fairness, these systems start out pretty innocuous but become more complex over time. Its brethren - FRIC a prime example of this, with that system removed from use in a similar fashion during 2014. I think it would be fair to say that this technical directive changed the landscape of the 2017 championship, not only for Mercedes, who now had a much less compliant car but also for Red Bull who’d been investing in their own system based on a similar idea. Fast forwarding to 2018 and Mercedes had been working away feverishly in the background to make improvements, knowing that Ferrari could now be considered a title rival. Sticking to their guns, and rightly so, the W09 features the low rake, long wheelbase concept, as the team shun ongoing speculation of a switch to a high rake car, like Ferrari had done in 2017. Whilst Ferrari improved upon their novel sidepod solution from last season, joined by several others, Mercedes opted to press on with their more conventional inlet and side impact support spar layout. In a teaser video for the W09, James Allison actually pointed out just how much work the team had done in this regard for 2018, repackaging internals and altering their aerodynamic profile. But it wasn’t long before the team realised they had to make a fairly substantial upgrade in this regard, with an entirely new concept installed in Austria to coincide with the new powerunit specification taken a race earlier, in France. The design takes inspiration from Ferrari’s concept but falls some way short of achieving the same result purely because a new chassis would have been needed to rehouse the upper SIPs. Even without this pivotal piece of the puzzle the new design serves the purpose of guarding the sidepod and the inlet from the wake generated by the front tyre, even if it's not pushed as far back and placed into clean flow like the Ferrari version. Whilst the ongoing aerodynamic development programme is clearly significant in the W09’s success story I think it’s also apparent from their pace of development when compared to Ferrari that they may have chased their tail a little, perhaps going down a few blind alleys even. However, where it really pales in significance is the work done by the team in terms of their suspension and tyre management throughout 2018. Tyre management is considered somewhat of a black art, with any number of variables narrowing their operating window and, for me at least, could explain some of the pace difference between the lead duo in the opening phase of the season. It’s a subject that tends not to get too much coverage as it’s just not something that’s easy to see, but for those of you that don’t know there’s actually two main temperatures to consider when we talk about tyres: the bulk or core temperature (ie the temperature within the tyre) and the tread or surface temperature. Both play a crucial role in the overall behavior of the tyre over one lap and a full race stint, with energy added into either having a domino effect. 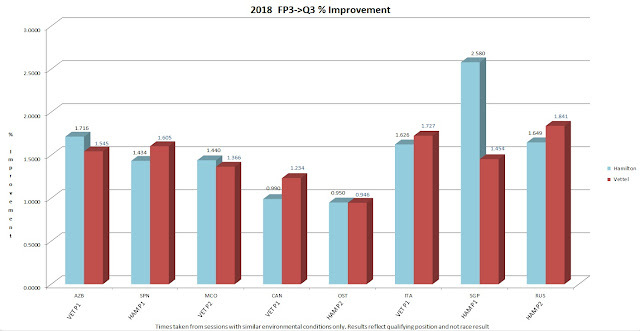 This makes understanding and operating the tyre absolutely crucial and with Ferrari’s SF71-H seemingly much easier to set up out of the box it gave them somewhat of a head start every race weekend, when compared with Mercedes, something they accepted in the early part of the season and worked hard to dial out of the car. Having yo-yo’d throughout the early to middle stages the championship seemed to being determined by who could get the best from their car at a given circuit, neither really having a significant advantage over the other, which made tyres even more of a pivotal factor. But as this knowledge and setup window began to converge things got even more interesting, as the driver also became an overwhelming factor. Of course, I’m not suggesting that they aren’t always a factor, but when the margins become exceptionally close you then need that extra few percent from the man behind the wheel to extract everything the car has to offer. Mercedes ‘home’ race in Germany offered some rest bite for the Silver Arrows, as Vettel failed to capitalise on a golden opportunity to nudge out his points tally, showing a chink in his and Ferrari’s armor at the same time. The Belgian GP proved to be devastating in the opposite way, previously the happiest of hunting grounds for Mercedes it was dominated by Ferrari who now seemed to have a short-burst power advantage over their closest rival as they got out onto the straights. 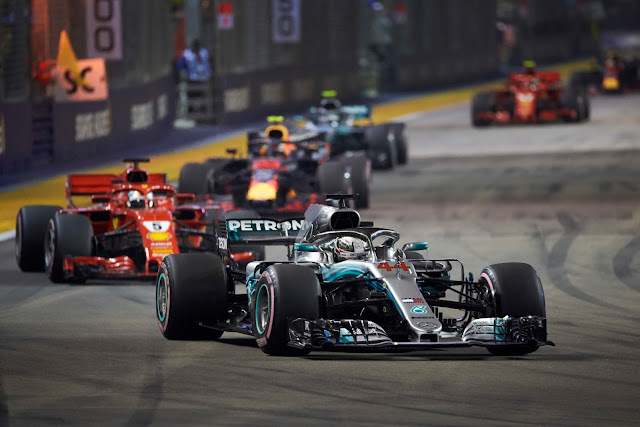 But it was Singapore, considered Mercedes bogey track, that would prove to be the site of their greatest victory, as the team clearly stumbled upon the answer to their woes. It’s easy to see that the team had installed an optimized rear wing for Singapore but it was the more difficult to spot changes on the rear suspension and rear brake setup that really made the difference. These are the changes that I believe unlocked the W09’s potential, altering the cars setup window and behavior, whilst allowing them to manage the tyres more effectively. A change to the preparation of the tyres (heating cycles with the blankets etc) coupled with the extremely slow out-lap on the way to the qualifying lap, Hamilton nailed what must go down in history as one of the qualifying laps of the sport. I say this not only because he seemingly nailed every single apex but because of the leap made from his fastest lap in FP3 (1:38.558) to his Q3 laptime of (1:36.015) - that’s just over 2.5 seconds quicker, an unprecedented margin between sessions from the Brit, as displayed below in a chart put together by my cohort Matt Ragsdale, comparing the improvement between FP3 and qualifying for both Hamilton and Vettel in 2018. (To put that into perspective, Bottas who also made a strong leap forward from FP3 to qualifying was 7 tenths behind his teammate but only made a leap forward of just under 2 seconds). This set the scene for a remarkable victory for Mercedes, who for the last few rounds had been on the back foot. Their form since then has been indicative of a team that has found that special something - which for me comes primarily from the tyres and their operation. This has left Ferrari reeling and whilst there has been speculation that their powerunit advantage may have been quelled by the installation of a second sensor on their energy store I do not buy it. Rather I’d suggest that much like the other more aggressive fuel and energy modes already used by the teams, they have to be measured against reliability, meaning you cannot run them flat out all the time. For example, Mercedes cannot and have not run their ‘qualifying’ or ‘party’ modes for extended periods in the past, it’s simply a risk vs reward scenario that requires the engineers to play close attention to not only performance but durability, something we’ve often heard Mercedes refer to as a matrix. I want to see a fight, the sport needs to see great drivers go toe-to-toe but the reality of this sport is that rarely occurs, as it’s an engineering challenge as much as it is a sport. Mercedes and Ferrari have given us two cars which are fundamentally so very different but manage to be within a few tenths of one another on any given day and that for me is a fantastic achievement, when we consider that everyone complains about a lack of design diversity. It’s there, for some reason you just can’t see it! In fact, here’s a rant, I often here the statement that if all the cars were painted the same colour you wouldn’t be able to tell the difference, I disagree, I know I would. This isn’t the 1970’s, lairy designs aren’t ever going to work, the only reason they did in the first place is that you had to test those designs in the real world to figure out you’d either got it demonstrably right or wrong in the first place, now we have cutting edge simulation tools that prove if it’s going to work before a real part is even made. Anyway, I digress… this championship, although not done of course, will go down as one of Mercedes and Lewis Hamilton’s greatest achievements should they be victorious, as they’ve had to work extremely hard to overcome the advances of Ferrari. Meanwhile, I have nothing but admiration for the Scuderia, as they have improved immensely at a point in time when other legacy teams, such as McLaren and Williams have faltered. The SF70H and SF71H have been truly fantastic pieces of machinery that have catapulted the team back toward the front of the grid and shows that they’re prepared to take calculated design risks in order to take the fight to Mercedes. Can I just say that this article and many of the improvements that might hopefully come on stream for the site in the future are thanks in part to the generosity of my patrons. If you'd like to support the site and my efforts then that's the place to do it - www.patreon.com/somersf1. However, I do deal in another currency - please share the article and my other content too, whether it's just word of mouth or through social media. Wonderful analysis; I wholeheartedly agree with you on all points, especially when mentioned people complaining about a lack of design diversity, when we're actually seeing a great variance up-and-down the grid, all constrained by the same rules and regulations. Excellent stuff.